A writer who defies categorization, Daniil Kharms has come to be regarded as an essential artist of the modernist avant-garde. His writing, which partakes of performance, narrative, poetry, and visual elements, was largely suppressed during his lifetime, which ended in a psychiatric ward where he starved to death during the siege of Leningrad. 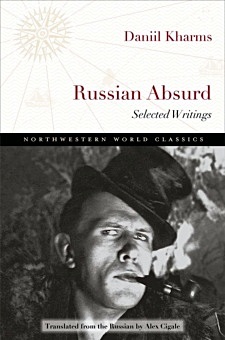 His work, which survived mostly in notebooks, can now be seen as one of the pillars of absurdist literature, most explicitly manifested in the 1920s and ’30s Soviet Union by the OBERIU group, which inherited the mantle of Russian futurism from such poets as Vladimir Mayakovsky and Velimir Khlebnikov. This selection of prose and poetry provides the most comprehensive portrait of the writer in English translation to date, revealing the arc of his career and including a particularly generous selection of his later work. DANIIL KHARMS (1905–1942) was a major figure in twentieth-century Russian and Soviet literature. An enigmatic and genre-bending artist, he was among the most significant voices in what came to be known as the literature of Russian absurdism. ALEX CIGALE was awarded an NEA Literary Translation Fellowship in 2015. His translations from Russian and his original poetry in English have appeared in such journals as the New England Review, PEN America, TriQuarterly, and World Literature Today.